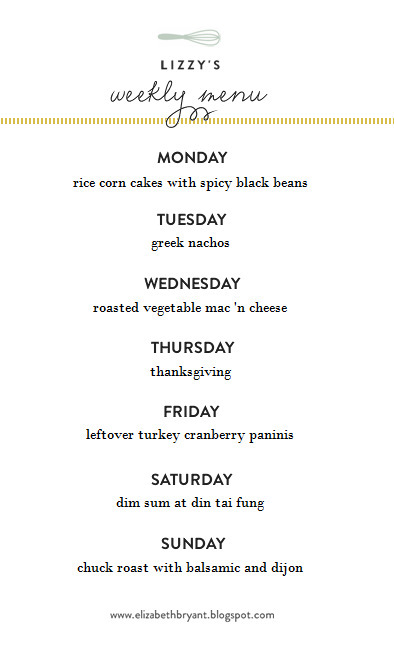 Here's this week's menu! I am so excited for Thanksgiving. This is my first time hosting Thanksgiving and I'm equally excited and nervous. I've never cooked a whole turkey before! Hopefully it isn't a disaster! Anyway, with Thursday being such a big cooking day, I'm making the rest of the week pretty simple. I suggest you do the same... and that you have a great Thanksgiving! You Need to check out Alton Brown's recipe for cooking a turkey. It's legendary, easy, and faster than most methods. He has a video on FoodNetwork.com explaining the science behind it all. I've done is many times and it always end up perfect! Brine! It is the best.